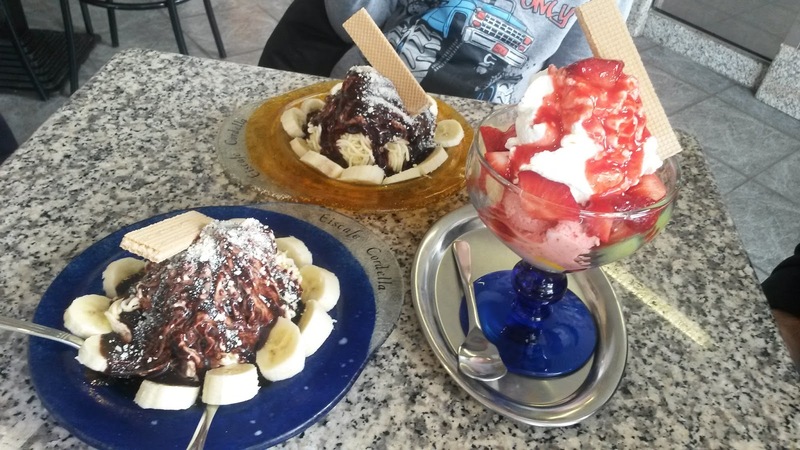 Previously, I posted about our trip to Bonn and Cologne. The last day of our vacation was spent southeast of Bonn, in Königswinter. It's the home of Drachenfels (Dragon's Rock), fortress ruins from the 12th century which perch 1000 feet up on a rocky hill. One of the legends of Drachenfels is that Siegfried, the hero of the Nibelungenlied, killed a dragon then bathed in its blood to become invulnerable. No dragons were killed on our vacation. I was hoping to hike up the hill, but was outnumbered three to one (sheesh! ), so we took the cogwheel train. I'll admit, the train was fun too. For anyone who's been there, there is one change: the old restaurant was torn down, replaced by a fancy new one with panorama windows. 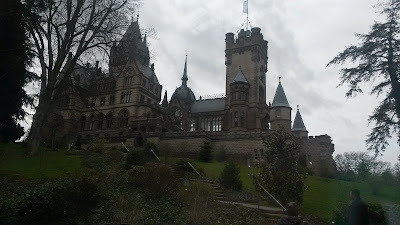 Halfway down the hill is Schloss Drachenburg. Built in the 1800s, it looks particularly dreary on this cloudy day. After we descended, the kids played along the shore of the Rhine while my husband and I watched cars get off and on the ferry. There are surprisingly few bridges across the Rhine in this area, so the ferry is the only way to get across. We ended the day by sharing some big, yummy bowls of ice cream before heading back to our hotel. Bonus: what's wrong with this picture? I love mini vacations. Can't wait for the next one!